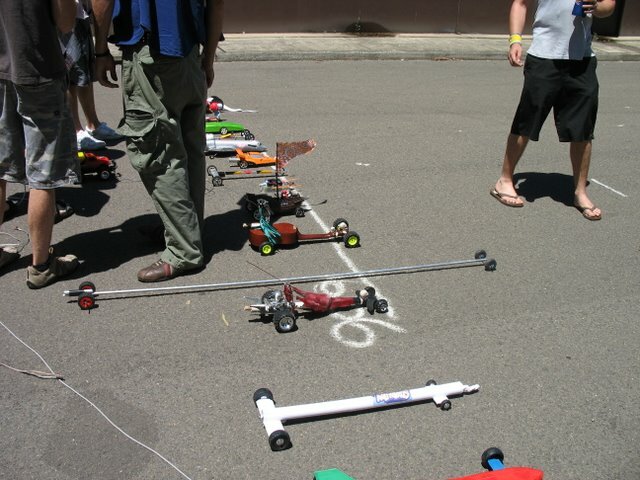 Hold onto your bowels, I'm glad to announce RocketCar Day 9 will be taking place Sunday July 15th. I will be sending out numerous reminders and updates obviously, but in the mean time get your new car concepts bubbling away, and reassure your parents you're fine but are too busy to visit on the weekend, so get off your back. Also, while not fending off over concerned relatives, send me the emails of anyone else who should be on the mailing list for these exciting updates. Anyhoo, book it in: Sunday July 15th. TBA: theme, new crazy rules, who’s making a BBQ. Hey, why not send me more photos? I found the results info. Here it is. Apologies to those who were not recorded... that's booze for you. I wish i hadn't lost the bit of paper that would have told us all about what these cars were all about. Ukulele cars, a flying pirate galleon of some sort, and one love themed space ship car. what a great world. A great range of cars representing the full spectrum from the amazingly stupid to the stupidly amazing. Also some finely engineered numbers turned up top battle it out at the end of the day. Snoopy Cars, Hover car worked, longest car ever, remote controlled support vehicle all round awesome. That's right, through the magic of the internet you can buy a great rocketcar day 8 t-shirt (i heart rockets). It's emotional and keeps you un-naked during the day. Dogs pay no heed to countdowns. 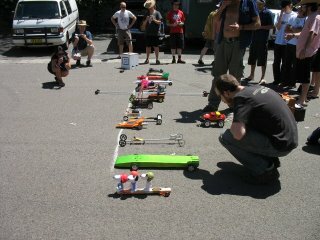 Rocketcar Day 8 had a great turn out, with a lot of emotion floating around. over 20 cars, lots of bystanders, great day all round. unfortunately my list of which car got where was lost in a terrible pocket accident so full kudos isn't avaliable for all racers. However, nonverified-kudos goes your way and in the most real sense you are all winners. 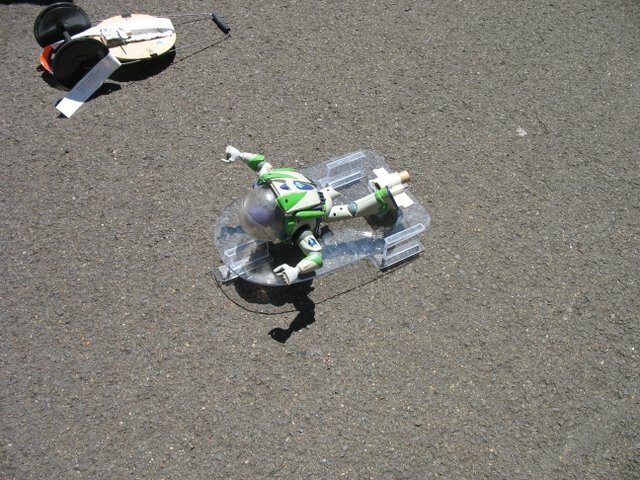 Except that Monarch the dog beat you all with his car Scooby Doo. Congrats Dog. 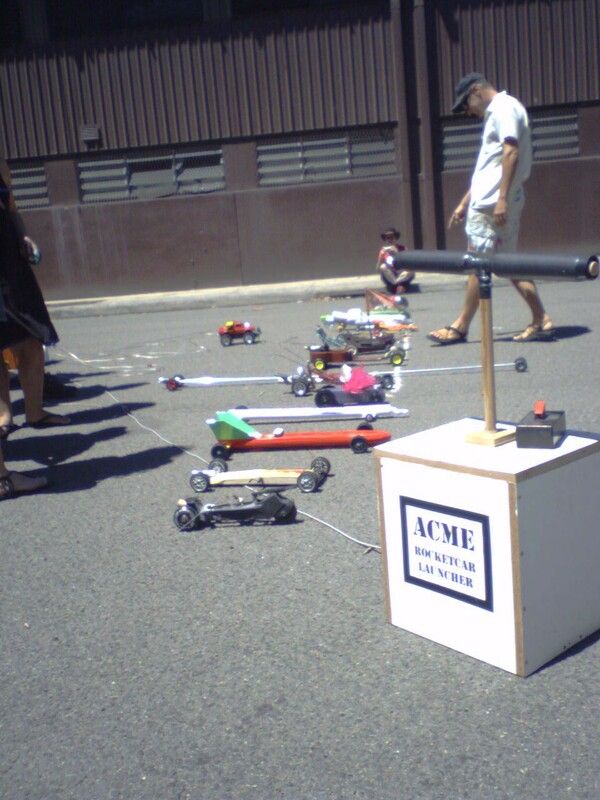 Where is RocketCar Day this year? well you may ask. 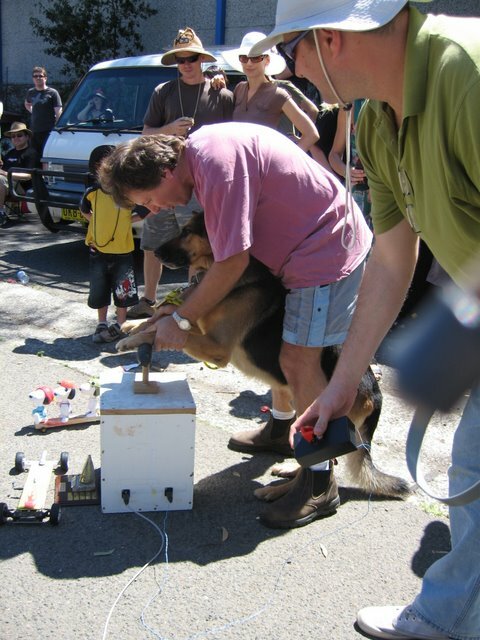 Rocketcar Day will be held at Sydney Steel Lane, Marrickville again this year. 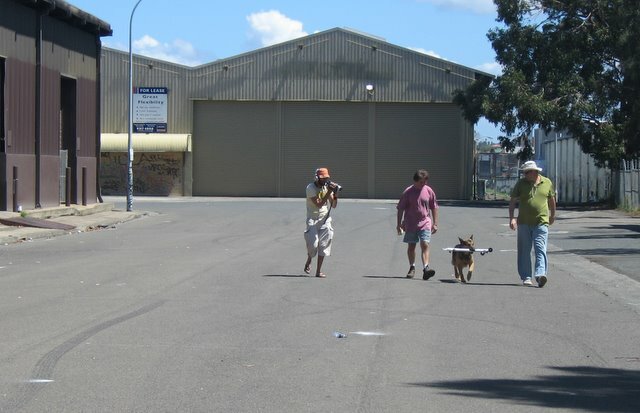 It's near the Metro Shopping Centre in Marrickville. If we get moved on from there, we'l go just around the corner. Get there at 12:30pm, especially if you are racing. Bring some snacks and some delicious beverages and maybe some sun burn cream. Oh baby, if you like love, you'll love Rocketcar Day 8.. the most romantic race yet. if you get lost call me on 0425222598. i may not be able to help you but i ,might be able to talk you down. 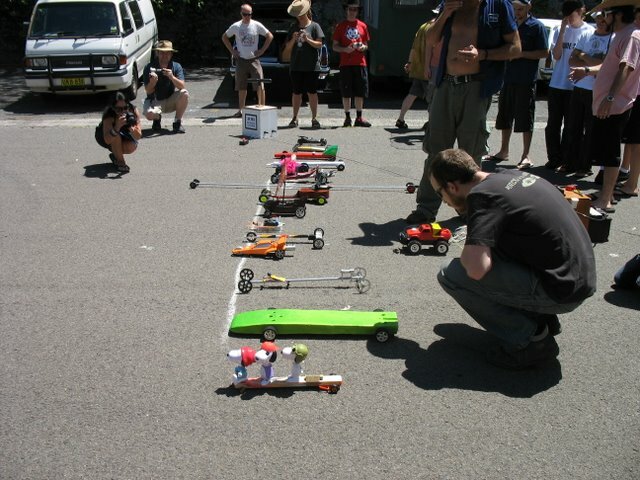 The first rule of rocketcar day is "there are some rules"
- They have to be safe(ish) to race. A good way to find out if your car is safe, is to test it. 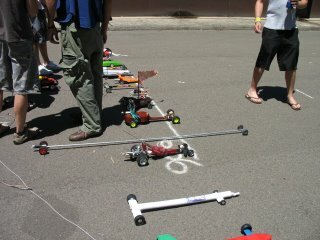 you learn alot when there's a rocketcar bearing down on you. Cars that are too light won’t be allowed to race, because they’ve been shown to tend to fly into people’s heads. testing: You can learn alot about how good your theories regarding rocketcar design are from watching your creation pickup and fly out of contol towards someone. if you can : test your car. 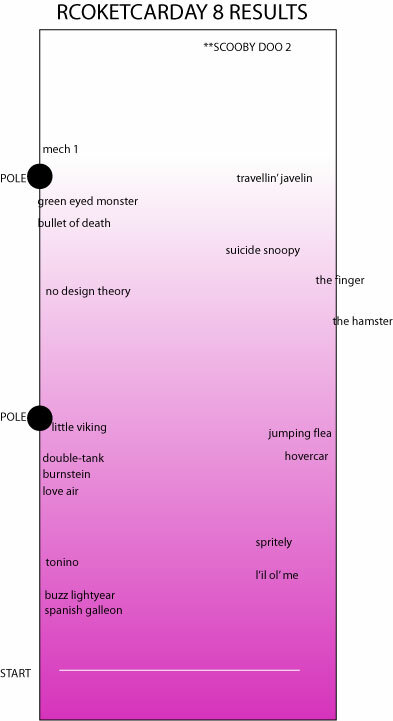 That said, there are 2 race categories. one for tested cars and one for first run cars. General: while you can make anykind of car, sticking wheels onto a rocket will incurr some sort of shame demerit. similarly, sticking a rocket onto a car is equally subject to frowning. Materials: Whatever, In the interest of safety please ensure that metal components are kept to a minimum and as safe as possible. Weight: avoid vey light cars. they are pronbe to spin around and shoot into the spectators and innocent bystanders. Motor types: C size rockets only in the race. Whatever the delay you like. C6 rockets seem to be cool. Only one motor to be used. No clustering or staging. You can buy them from hobby shops if you look trust worthy (swarthy types, trim beards first). These fit into a Romeo y Julieta no 3 cigar case nicely. Wheels: Three at least but more are permissible and all must be in contact with the ground on the start line and every effort must be made to keep all on the ground during the run. A car, which is bouncing and/or whose wheels are leaving contact with the track too much, at the judges discretion, will be banned. 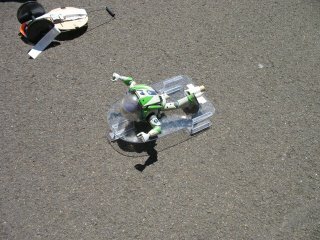 The wheels can be inside or outside of the car body. The car must end up on all 4 wheels. Remote Control : is not allowed due to it working one year. 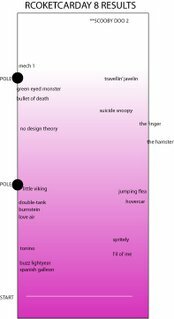 Gyroscopic control : is allowed due to it never having worked yet. Ladies and Gentlemen, prepare your heart strings for the most romantic rocketcar race on the planet: Rocketcar Day 8. Coinciding loosely with valentines day, Rocketcar Day 8 will blossom with emotion and sincere conversations on February 18th 2007. Why not save the money you'd spend on flowers and cards and GHB, and get emotional on the streets Rocketcar day style. Nothing says "i love you" like a Rocketcar Day t-shirt. Why not buy a collectors t-shirt from a previous Day to add a little romance into your life? They are guaranteed chick/dude magnets. Now for sale with paypal. Just write down what year you want. They are au$25 each plus 5 bucks postage = 30. 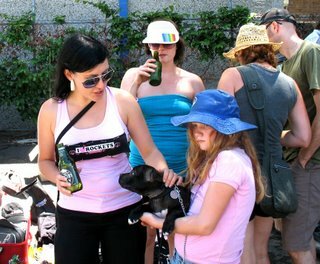 I have some of the classy polo shirts from Rocketcar Day The Third (the classiest rocketcar day ever) . They will be in fashion soon enough. I think for RCD8 we'll be getting some romantic stubbie coolers.